The first flavor I pick up is the black pepper, along with a light, watered down soy sauce. The chewing brings on the natural meat flavors, along with a touches of salt and garlic. There's a light spicy heat on the back of my tongue. 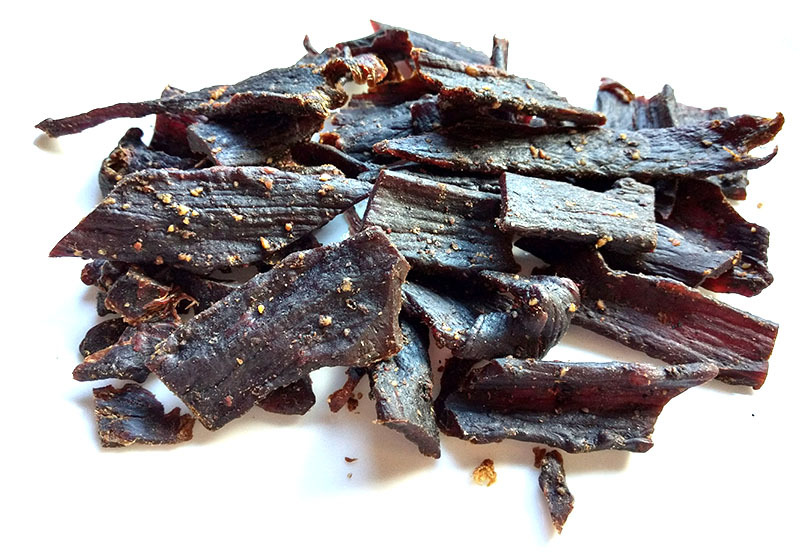 For being name, "Black Peppered", and being described as "a truly bold flavor", it holds up. There's definitely a black pepper flavor that jumps right out and makes itself known. And, it's definitely something one could describe as "bold" due to the soy sauce, salt, and garlic. the black pepper offers up some of its own heat, but doesn't quite have that freshly-cracked bite. It's still spicy, however. And it's still offers a lot of piquancy for black pepper lovers. I'd rate this a "medium" on our personal heat scale (level 3 out of 5). 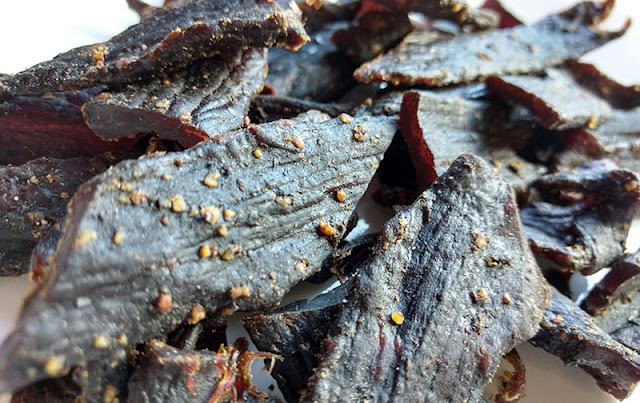 Otherwise, the primary taste profile is a moderately salty blend of soy sauce and garlic, spiced up with black pepper, and revealing a well-done cooked steak flavor at the end. The meat consistency is pretty good. It's lightly chewy, but manages to soften up without too much effort. It's very lean, with no noticeable fat. I felt no stringiness. Eventually, it takes on a steak-like chewing texture. 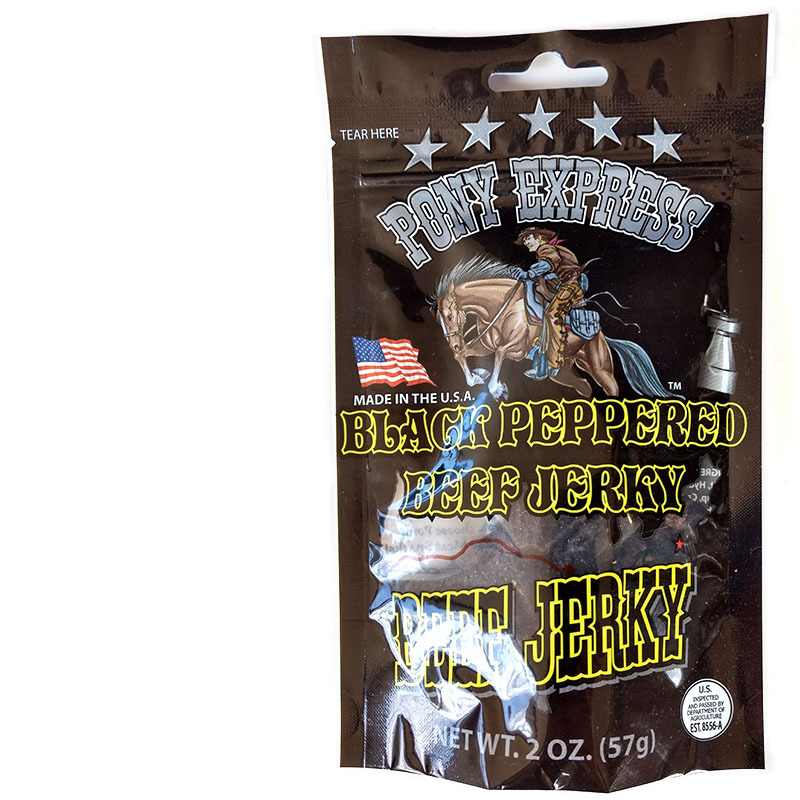 This Black Peppered Beef Jerky from Pony Express delivers a fair amount of black pepper flavor without going too far overboard. You get the classic spicy bite of black pepper corns, but not so much that it scalds the tongue. Because there's no sugar added to this, it ends up tasting more salty. As a result, the mouth still feels scorched after eating several pieces. But like the other flavors from Pony Express Beef Jerky, this has a simple, old-fashioned flavor that yields a sense of wholesome charm and natural goodness. It's very much comparable to the company's "Sweet Heat" variety we reviewed earlier, but without the sweet. It's a great jerky for folks who love a simple, old fashioned style and flavor.